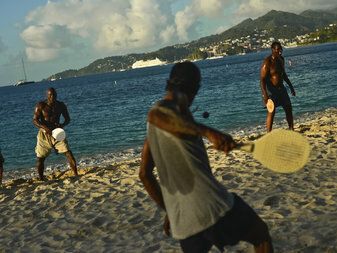 Meridith Kohut for The New York TimesLocal men play paddleball on Grand Anse Beach in St. George’s, Grenada. Climate change and other environmental disasters could put 3.1 billion people into extreme poverty by 2050, if no significant steps are taken, says an annual United Nations report on the state of global development. “While environmental threats such as climate change, deforestation, air and water pollution, and natural disasters affect everyone, they hurt poor countries and poor communities most,” noted the report’s authors. Though the world has become fairer overall, “environmental threats are among the most grave impediments to lifting human development, and their consequences for poverty are likely to be high,” according to the authors. The 2013 Human Development Report, released last week by the United Nations Human Development Programme, gives both a global snapshot and extensive predictions of the world’s state of development. Since 1990 the report has featured the Human Development Index, a number roughly based on life expectancy, education and relative income, to compare different countries and regions. This method of comparison has led to the oft-cited top ten countries to live in. This year’s report, The Rise of the South, looks at the countries that usually lag behind. “The Industrial Revolution was a story of perhaps a hundred million people, but this is a story of about billions of people,” says Khalid Malik, the report’s lead author in a statement. Besides the alarming humanitarian risks associated with environmental challenges, the report describes a world that is slowly becoming more equal. Extreme income poverty has plummeted from 1990, when 43 percent of the globe’s population lived on the equivalent of less than $1.25 a day, to 2008 when 22 percent of the world’s population, or very roughly 1.5 billion people, live at that level of income poverty. In China alone half a billion people have been lifted out of extreme poverty in that period. For the first time since the industrial revolution, Brazil, China and India have a roughly equal output to the industrial nations of Europe and North America. By 2030, the authors predict that 80 percent of the world’s middle class will live in what is currently termed the developing world. However, because of the risk of environmental disasters those gains could be slowed, halted or even reversed in places such as sub-Saharan Africa and South Asia, according to the report. The report highlights a paradox long described by experts: while those nations with the lowest development indexes are often not the polluters, they are bound to suffer more from a warming climate. The report’s authors cite the impact natural disasters have on developing island states, such as Hurricane Ivan’s devastation of Granada, which led in 2004 to an estimated loss equal to twice its GDP. The 2011 report, which focused on sustainability and equity, looked at the effects global warming could have on agricultural production, a major source of income for many. Because of environmental challenges, development — not just income levels, but also education levels and life expectancy — would see a sharp decline, especially in sub-Saharan Africa and South Asia. “Climate change is already exacerbating chronic environmental threats, and ecosystem losses are constraining livelihood opportunities, especially for poor people,” wrote the authors.